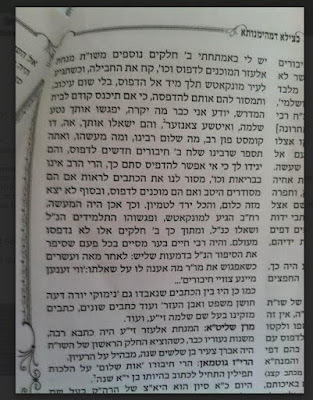 There is a famous saying that the difference between the Munkatcher Rov and the Sakmer Ruv was the gabbai. 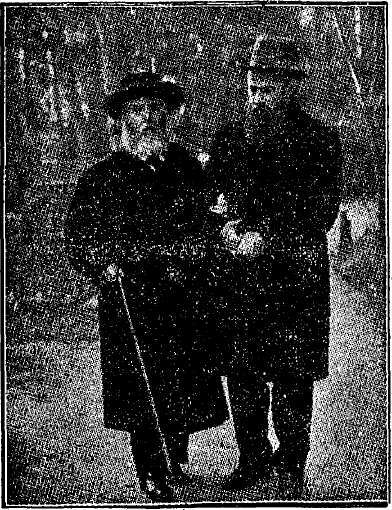 Yes, the gabbai. 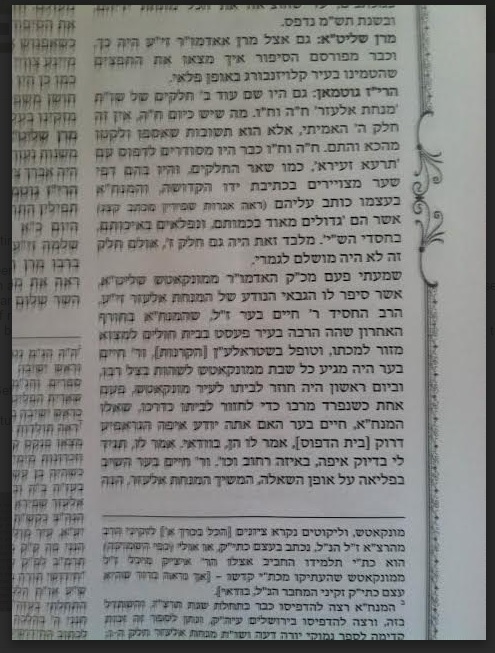 That Chaim Ber, the Munkatcher Gabbai, ran to the mailbox as soon as the Munkatcher Rov finished writing it, and ran to the printer as soon the Sefer was done. But Yossel Ashkenazi, the Satmar Gabbai, was not so quick. He always made sure there was a night in between finishing and sending or printing. That maybe the SR will change his mind, as was often the case, especially when things were written in haste or in response to a hot topic. Reb Velvel Guttman, a big Makever chusid, the publisher of Munkatcher seforim, visited Reb Hersh Mielech Sanzer/Klauzenburger when the latter was in New York recently. 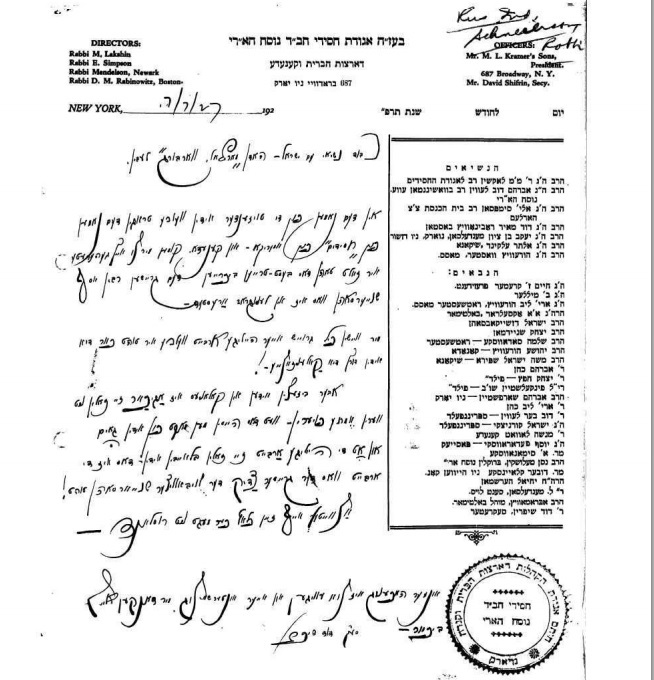 He had a story that shows that the Munkatcher was behind the rapid publishing of letters and seforim, while knowing full well that his close chasidim think that some of it has to be censored . 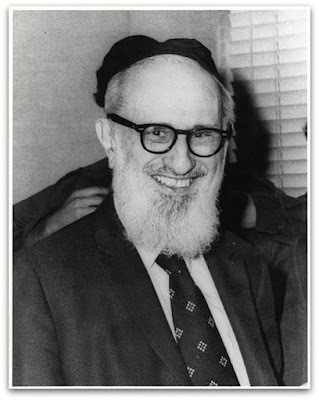 It was not Chaim Ber it was the Ruv. A chovev seforim told me that the sefer חיים ושלום עה"ת is the wildest Sefer with the most "sharfe leshonos." 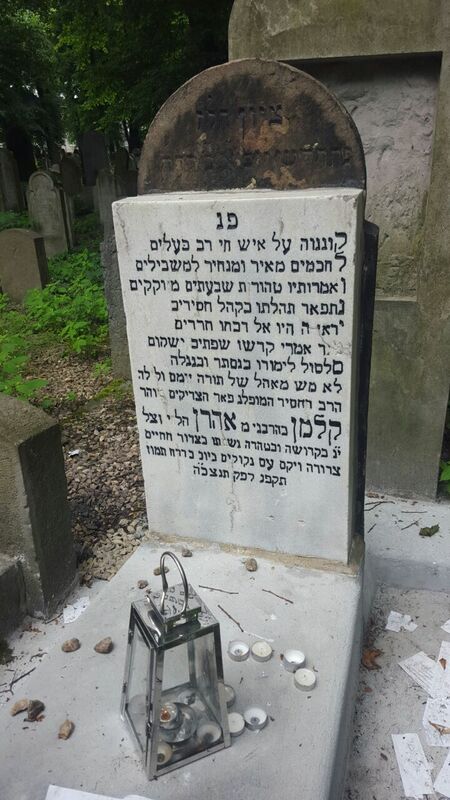 The rebbetzin was a very sharfe chusid and she didn't let anybody touch it ... So all the "wild" stuff stayed in there. 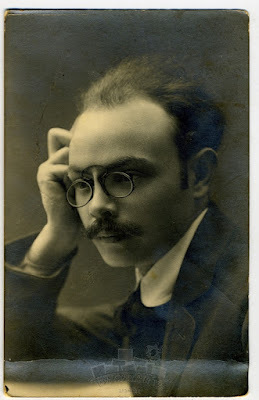 A letter to Mr. Felix Warburg by the Agudas Chassidei Chabad Nusach Ari organization in the US written on 7 Tammuz 1927/5687. 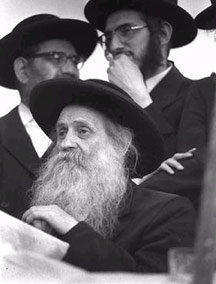 Five (5) days before the Rebbe's release. He was then in Kostrama, Russia, where he was supposed to spend 3 years. After having his death sentence commuted to ten, five and then three years. 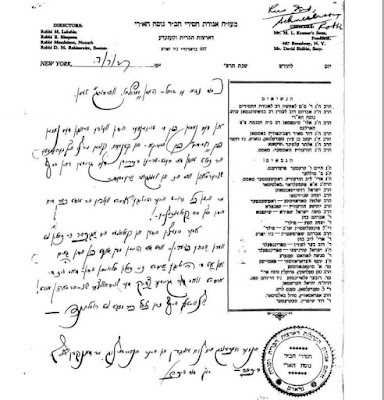 In the end he was released on 12/13 Tammuz and left Russia on Motzoei Simchas Torah 5688. "המשפיע החב"די ערך טיש לאביו מרחמסטריווקה"
Weird: the Rosh Yeshiva welcoming an office of BFG to Lakewood?! It's hard to tell what brought this on. Like, what made them decide to start this Yeshiva. Why now? Why Vilna. Why Rabbi Aderes and the American Wolpin. Why the need to shlep Reb Chaim into this? (that maybe can be explained) How will they guarantee that this goal is established and met? All that is partly beside the point. We wish them lots of success. But what got me was the ברייטקייט - putting it mildly, that this honored group has. 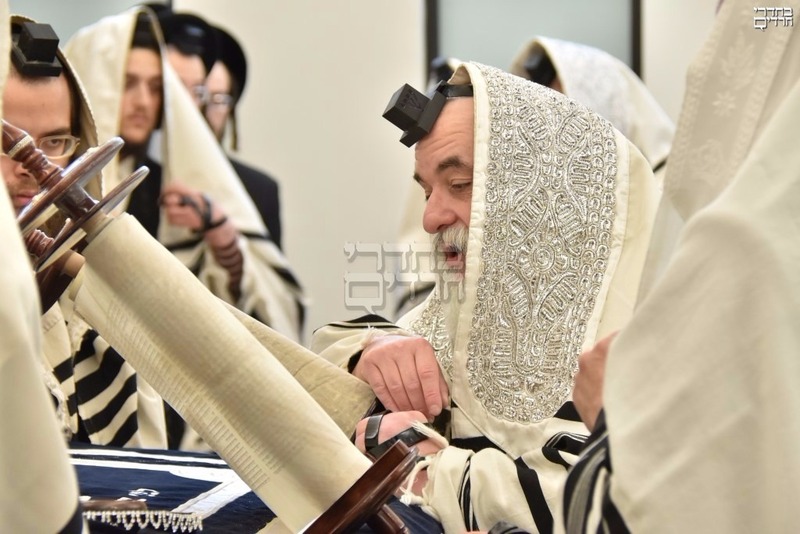 That they will save the matzav, as if it needed to be saved. I thought we had more Torah than we could handle - כביכול. But listen to the good Rabbi at about 3:30 in, where he speaks about the other aspects that the Yeshiva will iy"h specialize in: namely, that it'll accept money only from Shomrei Shabbos, and from: You heard it, Shomrei HaBris.... Now, who's going to vouch for that? will there be a questionnaire? Maybe he meant Shomrei Torah? who knows. They seem confused by what they're planning here. But in my estimation, if it takes a whole year to learn 10 blatt b'iyun in a standard Yeshiva, imagine how long it'll take to learn Shas b'iyun! But, like the headline reads, what takes the cake here is the old fashioned Misnagdishe ישות that beats its chest and says I'm here to save the world, שלא ישתכח תורה מפי זרענו ח"ו - and the only way to do it is by starting ישיבת וילנא. Tzig, Great job with the blog. A question that you may be able to help with - If you don't mind: Listen here to the story starting at 53:00. It's the story he wrote in Ish Hahalacha about if Hashem created the world lemaan tuvo or lema'an kvodo, and Rav Chaim said lema'an retzono. 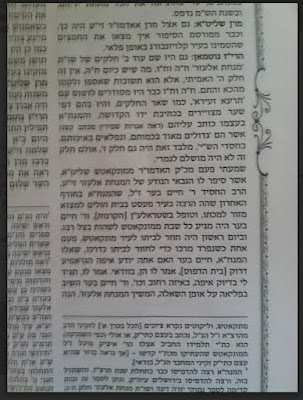 Except here he mentions that the Chabad sefer was a sefer of the Homiler, a point which is absent from Ish Hahalacha. 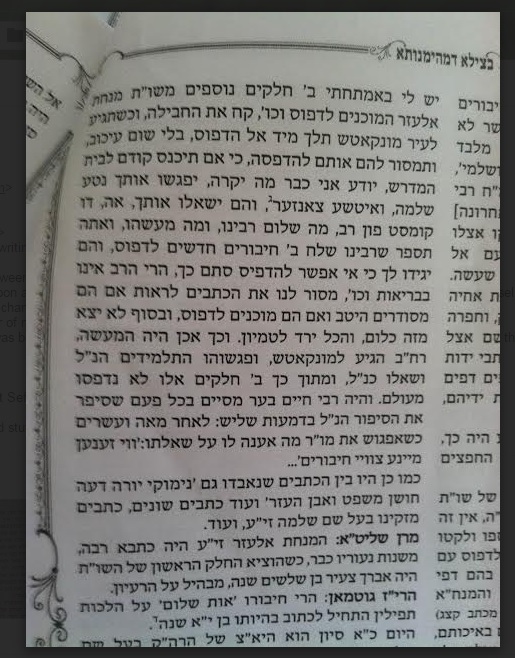 You and your chevra obviously would know the Homiler's seforim better than me, any idea where this is referring to? I wouldn't mind if you make a post out of this, so more people can potentially provide the answer. I seem to remember hearing this, or maybe even writing about it in the past. I'll allow more knowledgeable people than me answer the actual question posed here; אבער ס'האט מיר געבאדערט ווי דער רב זאגט איבער די מעשה, די זלזול אין ר' אייזל, אין תורת חב"ד - k'ilu Torah only exists by them. 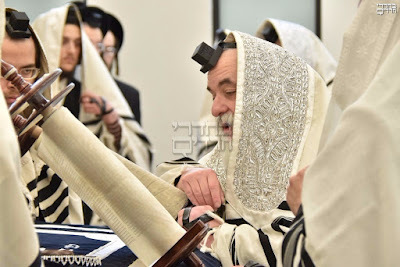 I assume he's saying it like the zeide said it, and maybe the audience at the shiur took it the wrong way ---- but the fact remains, it was a zilzul. ר' אייזל האט זיך נישט געדארפט שעמען פון קיינעם ניט, אי אין לימוד הנגלה און אי אין לימוד הנסתר. 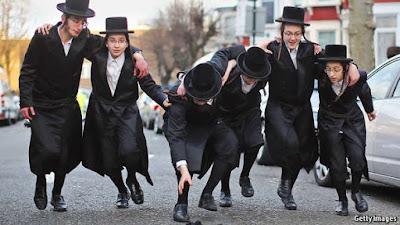 Is the שיטה הקדושה פון ויואל משה running out out of steam and not connecting to young people anymore? There was some talk about it a few weeks ago, where some young people were interviewed anonymously in some publication. Obviously those that were interviewed are likely not the guys you want to use as your "proof." They're not on the Satmar path at all. So the fact that they like the Land of Israel is not proof that the Shittah is bankrupt. But we're not talking about the guys in that interview. 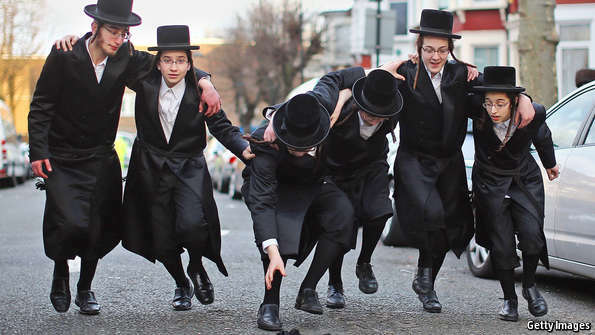 We're talking about young people, in their 20s, 30s and 40s, who send their kids to Satmar mosdos, who daven in Satmar shuls, and who may even spend all the דערהויבענע מאמענטן of the year in Satmar. Does the shittah speak to them? More and more we see that it doesn't, and for a very simple reason. It's tough to raise a generation on a basis that is the antithesis of what a Jew believes and yearns for. Eretz Yisroel is in the heart of every Jew. He yearns to go there, whether he feels it or not. It's part of our past, present and future. Some choose not to see any of the wrongs going on there, because of the love, and I dare say, some choose to see EVERYTHING as wrong. Maybe because they love it so much, and it's hard to see a beloved country, G-d's country, act that way. Young people, however, they're in need of love, to love and be loved. They can't live the way their parents and grandparents did. This is true with regards to most things in life, the way they raise their families, and even the way they see Eretz Yisroel. They need to love. The Shittah was good for the old generation, it doesn't seem to be working with the younger ones. Even if we do see bochurim marching and wearing sackcloth, and even if we see 13 year old kids saying דאון וויט איזראעל. Apparently they were told that the appeal was for the Joint, not UJA. That kashered it. 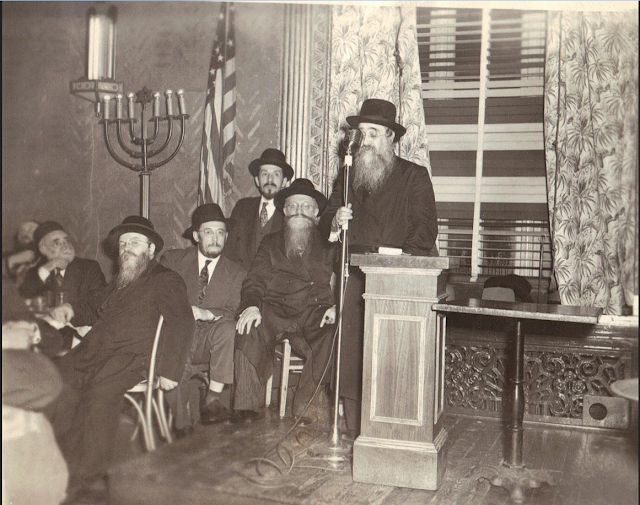 Satmar received lots of help from the Joint in the early years of settling in America, as did many others. 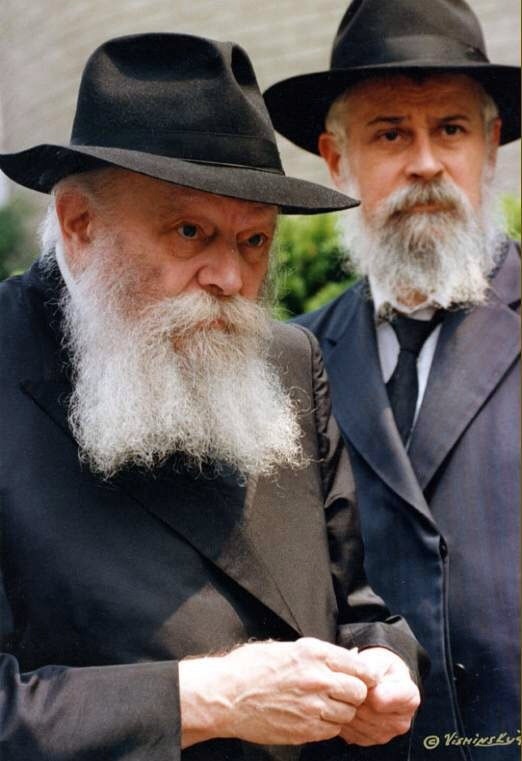 Including Lubavitch, of course. 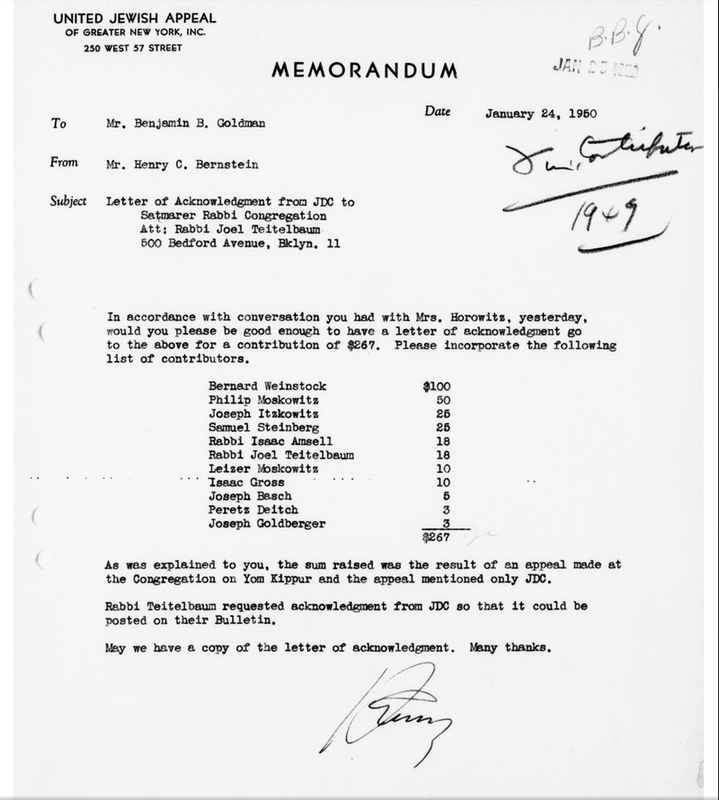 Many Jews received apartments and weekly stipends from the Joint. I guess this was a way of showing appreciation? 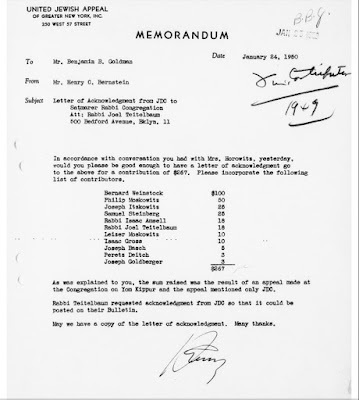 UJA was treyf, I assume, because it was Zionist/Reform/Neolog. But the Joint was basically the same treyf, so go figure. Hard to tell when the appeal took place, before Kol Nidrei? after Shachris? Who is this Yakov Herzog from Czechoslovakia who so harmlessly pokes fun at Rebbes and their Shabbos tables? He sounds like in his house they poked fun at Chassidim and their Rebbes. A nice Oyberlender Yingelle whose parents dreaded that he become one of them.